Are you looking for a new way to celebrate your child’s special day? Book your MHDC Birthday Bash today! Birthday Bashes include dance combinations and games as well as pizza and cake! After hosting countless birthday parties, parent’s comments are all the same! They love the organization, endless activities and birthday surprises! They enjoy being able to sit back and watch their child celebrate the day they’ve waited for all year! They also love the ease of planning and not being responsible for clean up duties! 1. Pick your theme! We have a variety of themes to choose from, or create your own! 2. Decide who’s coming! Parties are planned for up to 10 children, although for an additional cost, more are welcome to join! 3. Set the date and send the invite! We can provide you with the invitations needed for each of your friends to get the invite to join in on the fun! MHDC also provides the thank you cards! Celebrating birthdays with MHDC couldn’t be any easier or more fun! Why settle for a traditional birthday celebration at your home, movies, or mall, when you could be having a blast movin’ and groovin’ the day away! 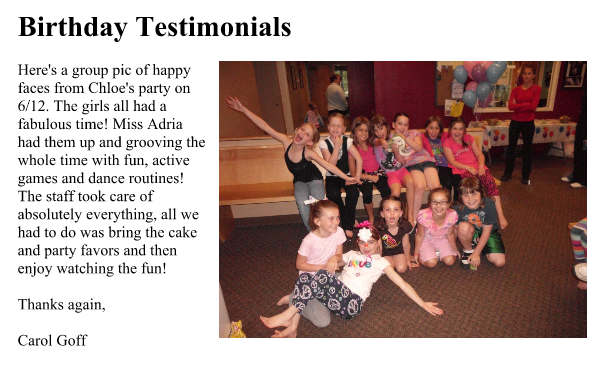 We promise to make your child’s day a special day – filled with memories and fun to last a lifetime!